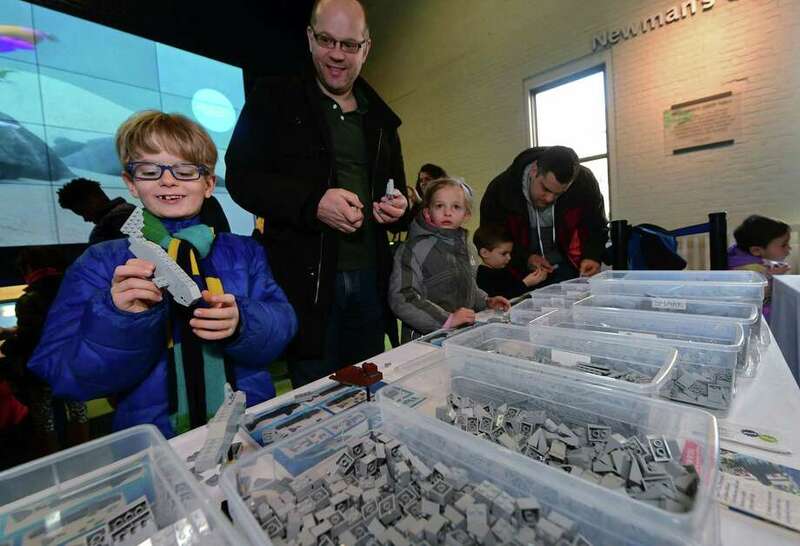 Visitors to The Maritime Aquarium including Oscar Egmond, 7, and his dad Lennart Egmond of Weston help Play-Well TEKnologies engineers create an enormous aquarium-themed scene using Lego building blocks during “LEGO Weekend” Saturday, January 26, 2019, at the aquarium in Norwalk, Conn. Throughout the weekend, The LEGO experts from Play-Well TEKnologies engineer a giant project made entirely out of LEGO blocks in Newman’s Own Hall. Visitors build small LEGO marine creature from a diagram or create pieces of their choosing that will be part of the finished display. The event continues Sunday.